I put the "wood" pieces together and painted them with an acrylic pale peach paint. I then put Mod Podge Sheer Brown Transparent over it. It gave it a nice aged look. Before putting the actual sewing machine into the base, I used a silver fine tip paint pen and added the silver accents, as shown in the picture. Tying some thread around the spool adds a cute bit of realism. There is room to slide a thin piece of fabric under the needle to make it look as though the seamstress is still working on the garment. 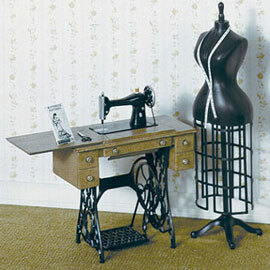 A painted the top portion of the mannequin to match the sewing machine. I left the bottom stand black to match with the black of the sewing machine. I glued a bit of fabric to the top of the mannequin.